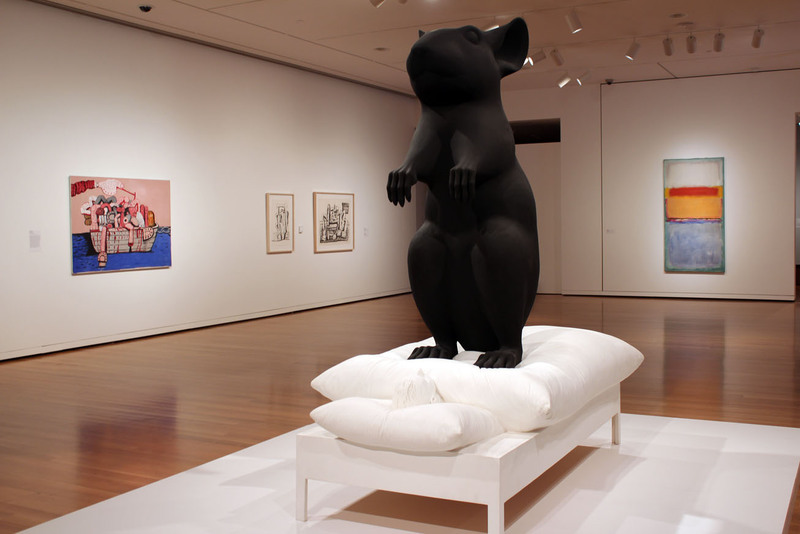 SEATTLE—There is a plaster sculpture of a naked woman sitting on a metal frame bed in the process removing or putting on her underwear and a statuesque black rat standing astride a man peacefully sleeping in a bed dressed with fluffy white linens. The offbeat installations are a part of the Seattle Art Museum‘s “Theater of the Absurd” exhibition featuring works from its collection. 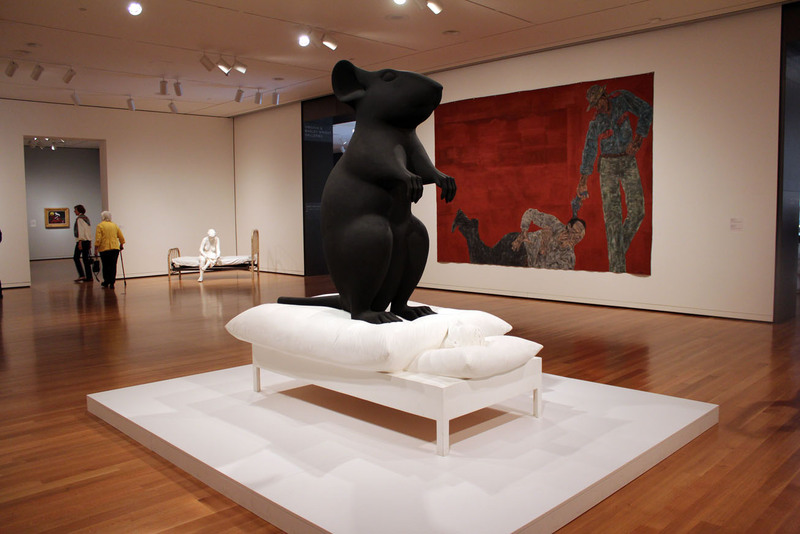 “Mann and Maus,” 1991-92 (polyester resin and paint) by Katharina Fritsch, with “White Squad II,” 1982 (acrylic on canvas) by Leon Golub, in the background at right. 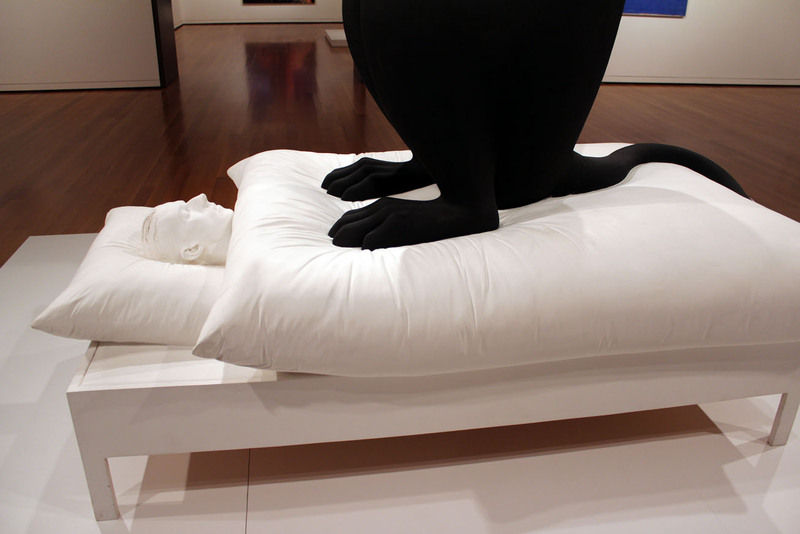 Detail of “Mann and Maus” by Katharina Fritsch. 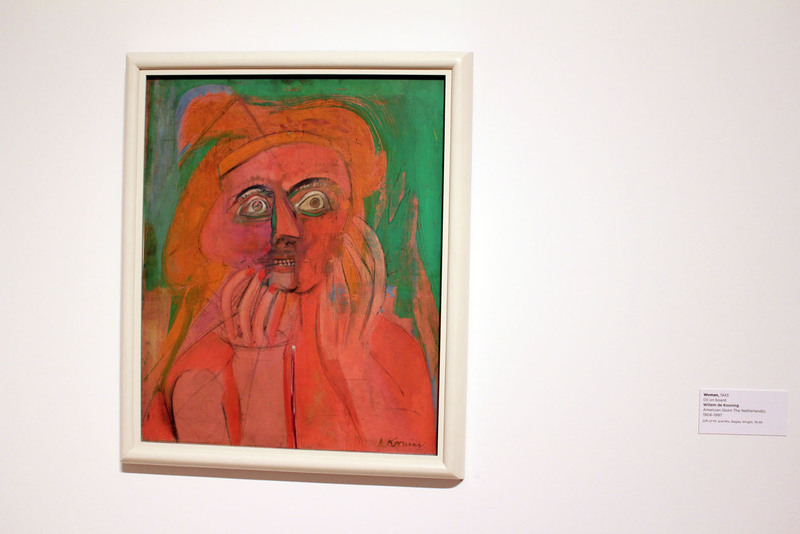 “The Woman,” 1943 (oil on board) by William de Kooning. 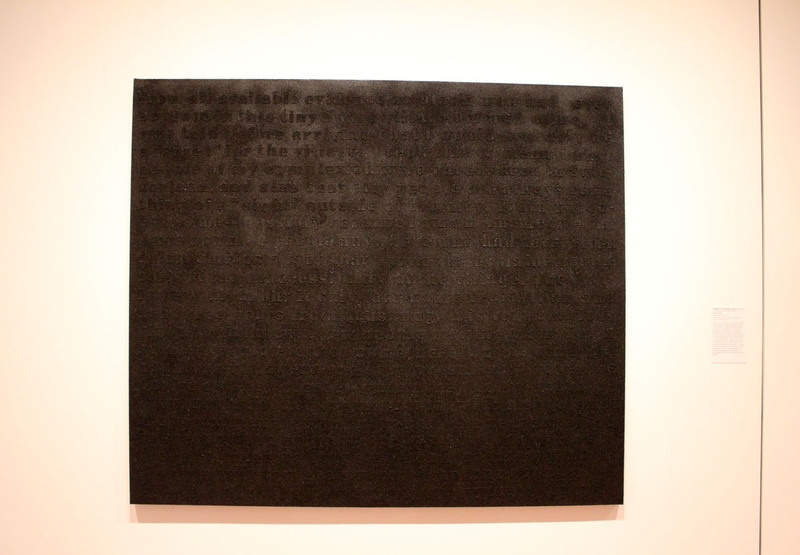 “Stranger in the Village (Excerpt), #7,” 1997 (coal dust and oil stick on linen) by Glenn Ligon. Upon close inspection, the raised type on Ligon’s finely textured canvas can be deciphered. 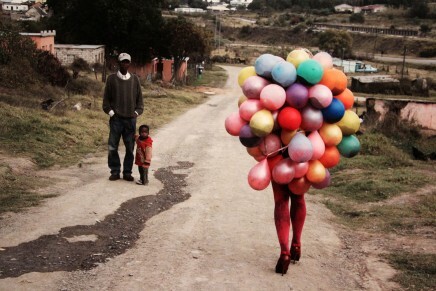 The work contains an excerpt from James Baldwin’s essay “Stranger in the Village: An Essay in Black and White,” which was first published in 1955. Alternative view, “Mann and Maus” by Katharina Fritsch, with “The Fable” by Phillip Guston, in the background at left. 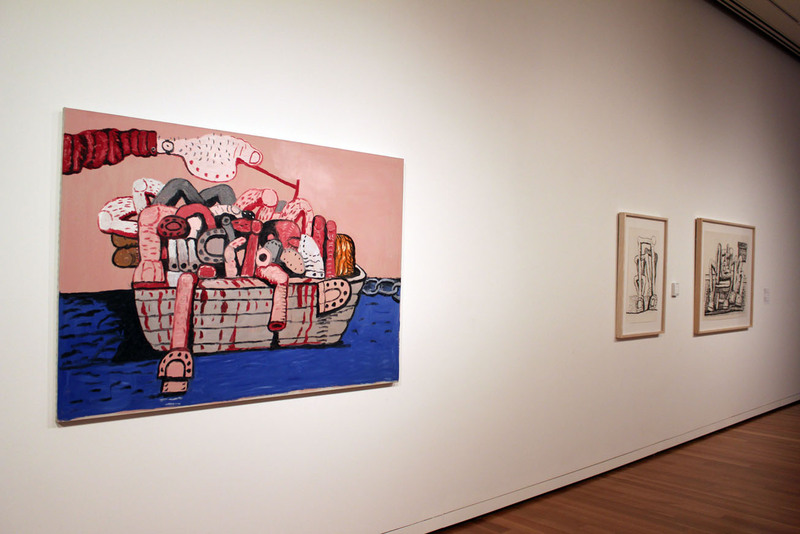 “The Fable,” 1977 (oil on canvas) by Phillip Guston, with “Group” and “Room” at right, two 1980 lithographs on paper by Guston. 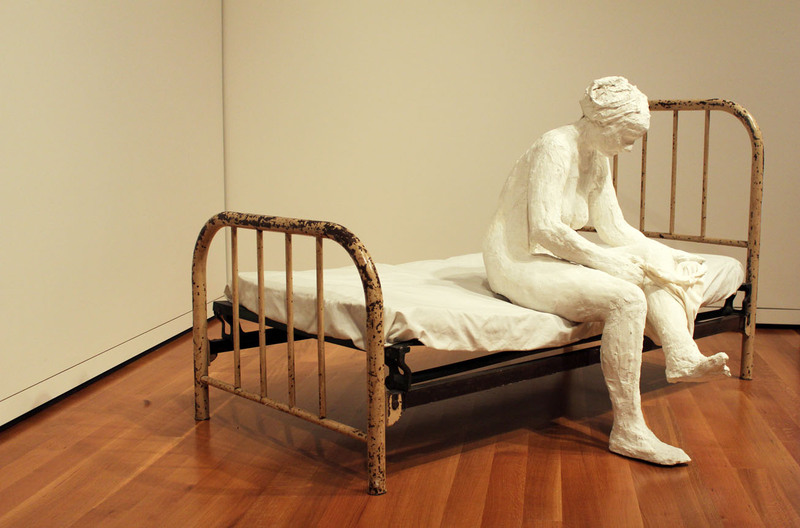 Alternative view, “Woman on a Bed,” 1963 (plaster and metal) by George Segal (also shown at top of page). 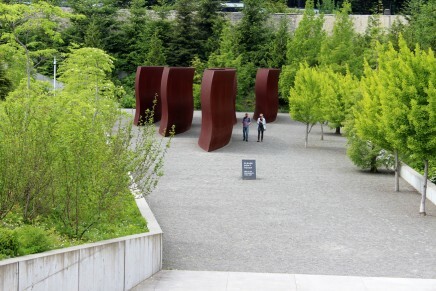 See a couple more works by Segal on view in New York and Washington, D.C. 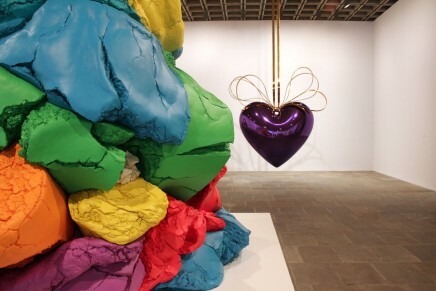 The following two works, presented in an adjacent gallery, complement the theme of the absurd. 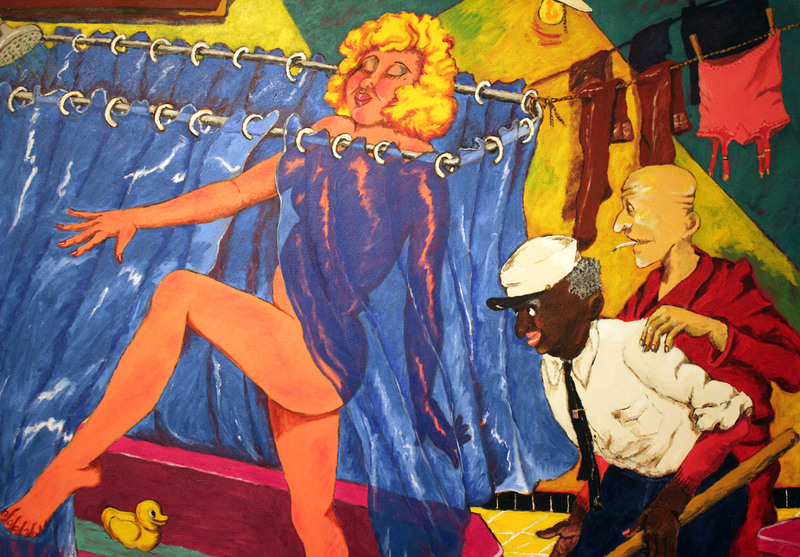 “Suzanna and the Elders (Novelty Hotel),” 1980 (acrylic on canvas) by Robert Colescott. Colescott’s work addresses racial tensions usually with a wry sense of irony. According to the museum’s description, he is recreating the Old Testament story of Suzanna and the Elder here, adding his own twist by setting the scene in a seedy hotel. “The Elders, one black and one white, are here united in their desire for the blonde beauty who is about the step from the bathtub.” At the top of the canvas, Colescott has painted himself into the situation, peering through the window. 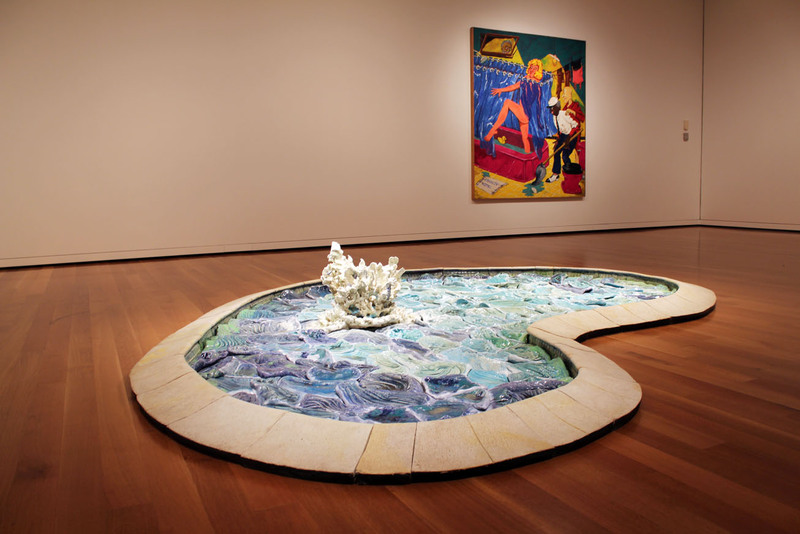 Installation view of “Pool with Splash,” 1977 (ceramic with glaze) by Robert Arneson, with “Suzanna and the Elders (Novelty Hotel)” by Robert Colescott, in the background. 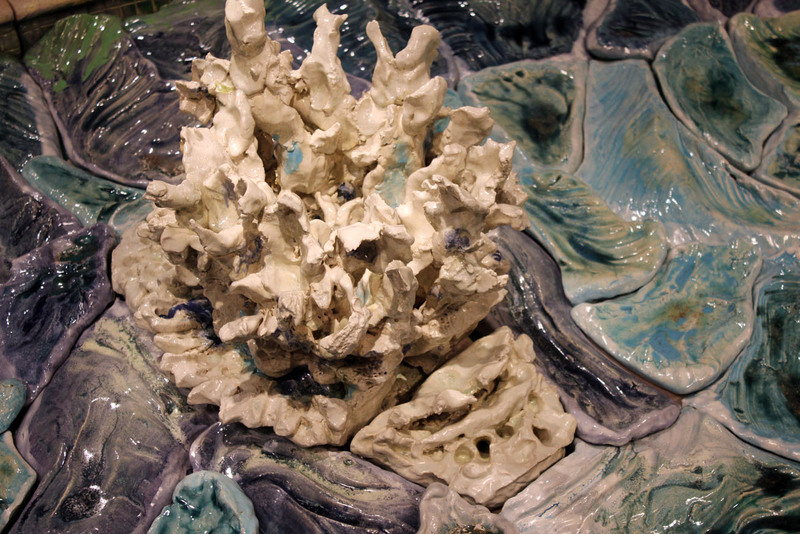 Detail of “Pool with Splash” by Robert Arneson.